Here is a shot showing the plexi-glass from below. My plan is to create the patterns from cardboard and then go to Tap plastic and get them cut out neatly. The final forms will be more invisible. 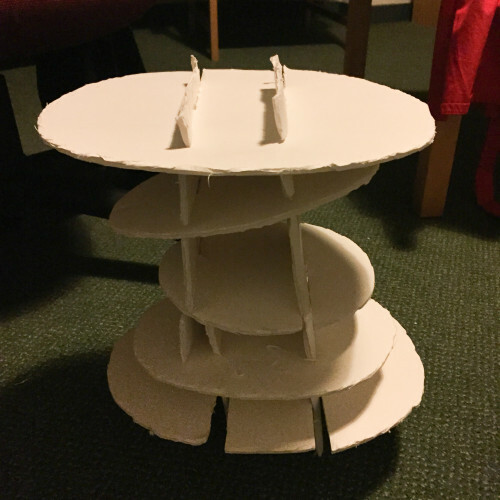 Since I was traveling overseas I decided to just take a few pieces of foam core board with me in my largest suitcase to muddle through making a form during the conference. I didn’t find a tutorial but I knew I’d just have to take the circumference measure of the corset in multiple places then create two straight pieces with slashes in them to hold the ovals in place. I went to work hacking it with my paper scissors. I’d recommend you draw them then use an exacto knife for a clean finish. But for a first try, out the door it worked tremendously well. Part way through I broke the middle two sections and had to piece together more sections but for all the weird angles it did its job! 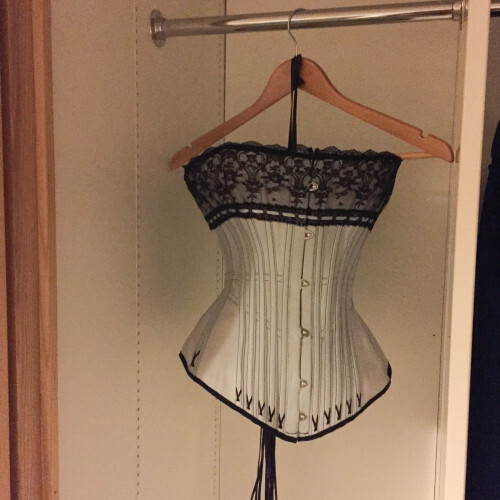 I cut off a piece of lacing form one my corsets and hung it up in my closet. The bottom I left longer sections so that the corset could be displayed sitting on a table as well. 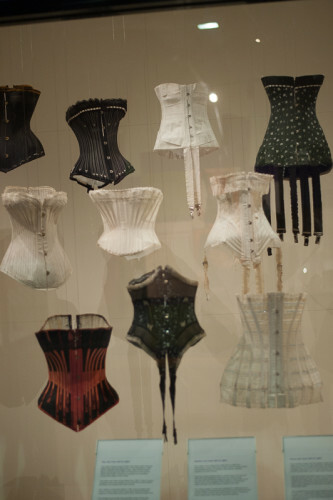 I hope to revisit this idea and make some beautiful forms to hang up some corsets around my workshop. I have these tall ceilings and unused upper space. This is awesome! Thank you for sharing this!